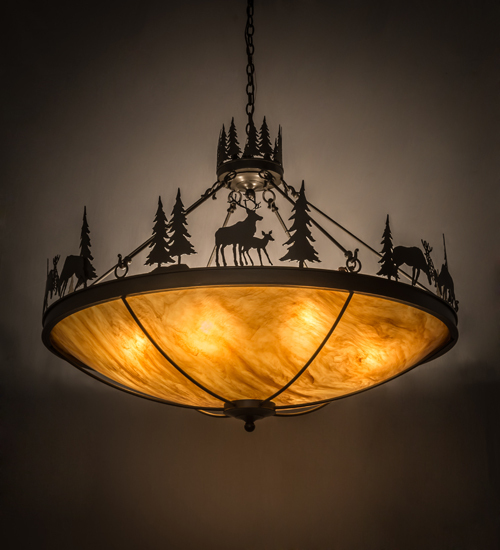 Description: This striking wildlife design captures a family of Deer standing among the Pine trees in the woodlands above an exquisite diffuser featuring Ambra Siena Idalight with a stunning look. The fixture is enhanced with a frame, hardware and decorative accents offered in a rich Timeless Bronze finish. The pendant is ideal for hallways, living spaces and other rooms in residential and commercial environments. The fixture is handcrafted by Meyda artisans at the foothills of the spectacular Adirondack Mountains. Options include dimmable energy efficient lamping, as well as custom sizes, styles and colors. This fixture is UL and cUL listed for dry and damp locations and resistant to coastal salt air conditions.